You are currently browsing the Carpe DMM blog archives for August, 2015. We’ve checked into a motel in Angaston in the Barossa Valley as we wind our way south again, having said goodbye to the Clare Valley today. 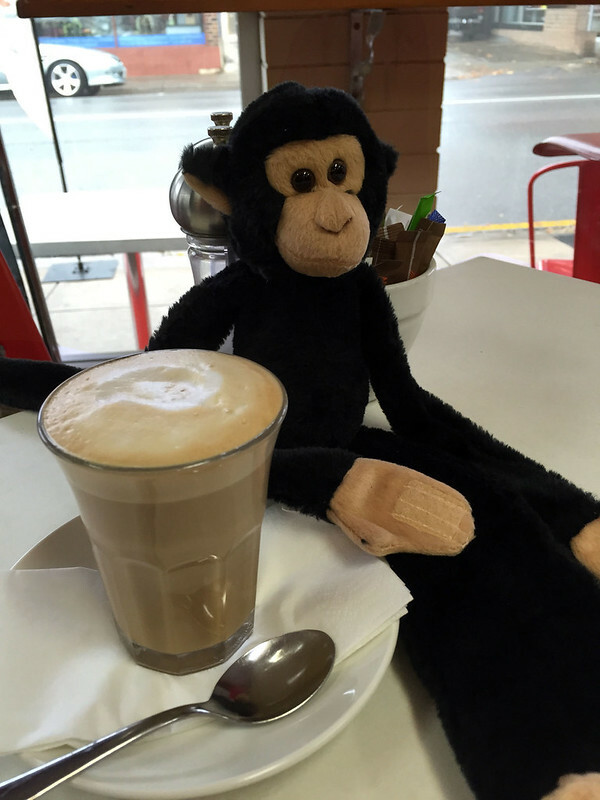 We got up and headed into Clare to have breakfast at Wild Saffron, a cafe that M. wanted to try. We got there just as the doors were opened at 08:30. We took a table near the front window, next to a wall where various celebrities had signed and left messages. We identified messages from Catriona Rowntree and Stuart MacGill among some other less familiar names. To eat, we both had the “healthy trio” muesli, with fruit salad and yoghurt. The muesli was slightly toasted but not sweet, and had macadamia nuts in it. The fruit salad was watermelon, rockmelon, pineapple, and grapes. Breakfast coffee at Wild Saffron. Read more: We get lost in the maze, visit a Georgian mansion, have lunch at a winery, and eat the Best Pizza in Australia (2009) for dinner! We got up this morning and drove south to Sevenhill, the next town along the road from Clare. Here we went to The Little Red Grape Bakery, which was open from 07:00, to get some breakfast. We had the idea that they would have a sit down breakfast menu, but it was simply a bakery cafe with the bakery wares that were on display. Since nothing else opened until 09:00 on Sunday, we made do, M. getting an apricot danish and a coffee, and me getting a sausage roll and vanilla slice. After eating, we took the short drive to the nearby Sevenhill Cellars winery. This was the first winery established in this region, and was founded by Jesuit monks, to make sacramental wine. They still make authorised sacramental wine, but have diversified into a range of table wines similar to other wineries in the area. 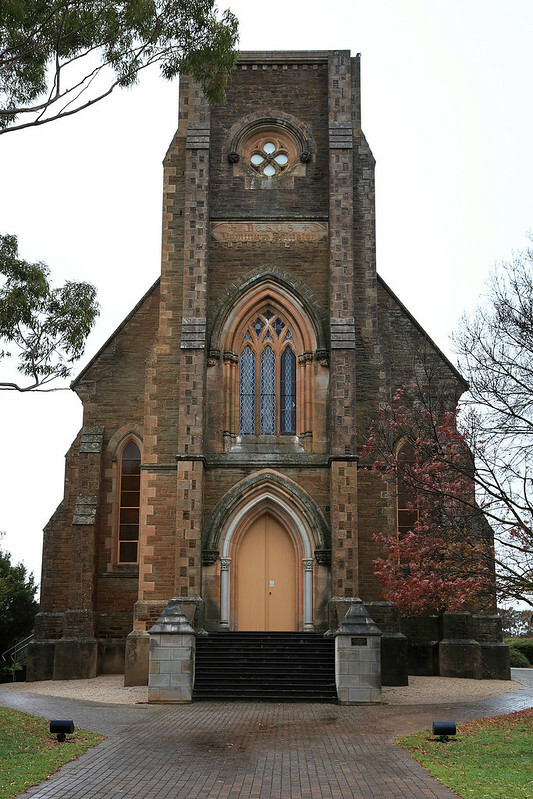 The grounds of the winery include a marvellous old church, St Aloysius, which we drove past in pouring rain to get to the cellar door and wine tasting room. The weather today began dismally, grey and dreary with driving rain. We are sitting in the Barossa Valley Brewery, having a drink before dinner. The brewery bar and restaurant is in an old house and we are in a small room off the side, sitting in comfy armchair in front of a fireplace which is nice and warming. The weather today was cold and showery, and occasionally windy as well, so it’s good to warm up a bit. We began the day by walking from our cottage accommodation out to the main street of Tanunda in search of a cafe for breakfast. It was about 08:30, and the first two cafes we passed didn’t open until 9, but we found a place called Keil’s which was open. It looked good, and we ordered some home made granola with roasted strawberry yoghurt for M., while I had fried mushrooms on toast with ricotta and caramelised balsamic vinegar. The toast was thick slices of a Vienna loaf baked by a local bakery. It was all good and M. said the granola and yoghurt were good too. 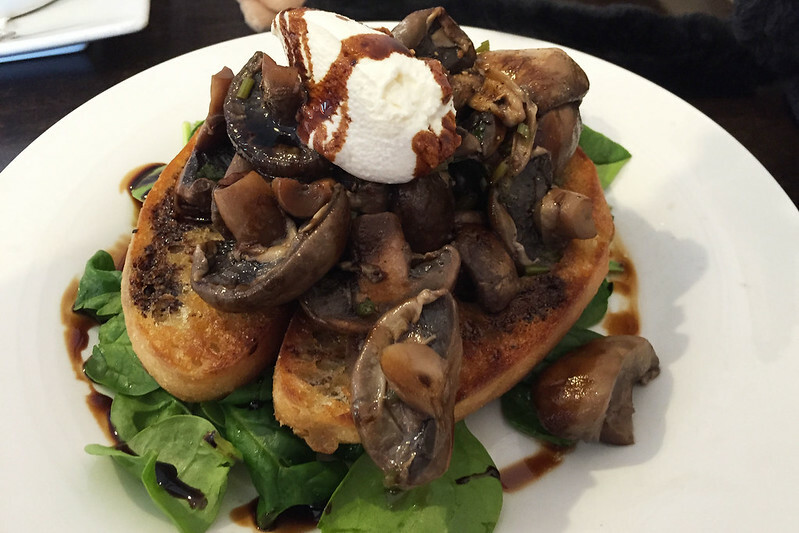 Mushrooms on toast at Keil’s. We walked back to our cottage and packed before leaving the key in the key cabinet thingy outside, then hopped in the car for a day of exploring the area. We began however by driving up through Nuriootpa to find the Barossa Gateway Motel, where we planned to spend tonight. I tried calling earlier but nobody answered, so we stopped in to see if the had a room free, and secured one for just a bit more than half what we paid for a night in the cottage. That done, our next stop was Maggie Beer’s Farm Shop, which we arrived at just as it opened at 10:30. Despite this there were dozens of people there already, browsing the shop and tasting the products. There were tasting dishes of maybe thirty different products out, with lots of clean wooden sticks and plastic spoons for people to use. We tried jams, chutneys, sauces, preserved fruit in verjuice, some mustard pears, and olive oil and dukkah with bread cubes. They also had a salted caramel sauce and a chocolate vino cotto sauce. 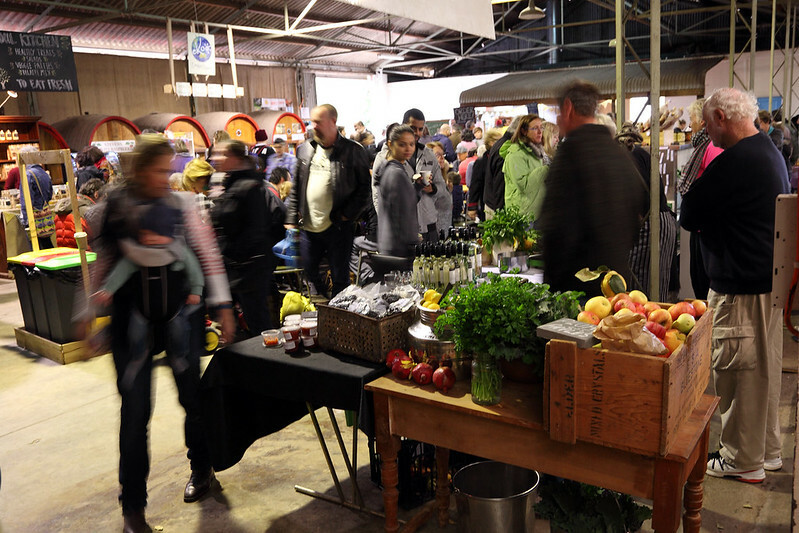 The variety was amazing and we could have potentially had a meal just by tasting everything a couple of times. There were plenty of cafe tables too for people to sit and eat the various snacks and cakes on sale. The building overlooked a picturesque lake which would have been nice to sit outside and look at while eating, but a heavy rain began falling while we were inside. We bought four jars of jam and a jar of the chocolate sauce for M.’s dad, then raced out to the car. Read the rest of this day: it’s a bit of a food day!